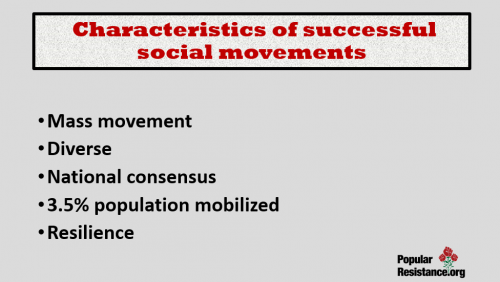 We cover some of the new data on successful social movements, characteristics of successful social movements, how to build a movement, when to negotiate and the effectiveness of violence versus nonviolence. 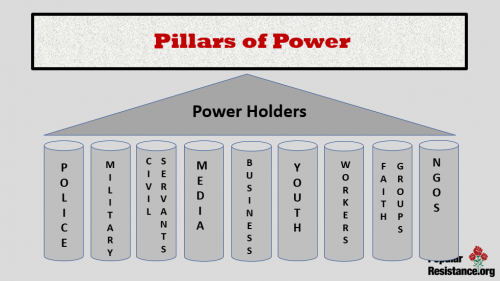 Power is held by “pillars of support” — organizations inside and out of government that allow it to continue day-to-day operations. When those pillars are weakened sufficiently the structure collapses like a building when its support structure gives way or is weakened. Business community provide essential services for the people, in US provide money for campaigns. 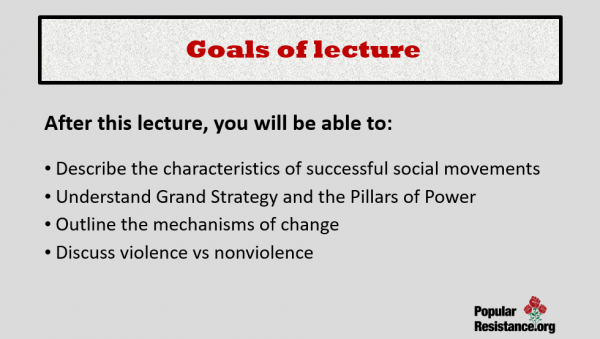 Goal is profit and they must see a role for themselves in the future. Youth Those in power do not want youth to become active as they are the normal vanguard for change. Youth need to see they will gain in the new world created by the revolt and see the limits of the current reality. Intellectual clarity of right vs. wrong is a key motivator. Workers are being weakened by destruction of unions, globalization and stagnant wages. 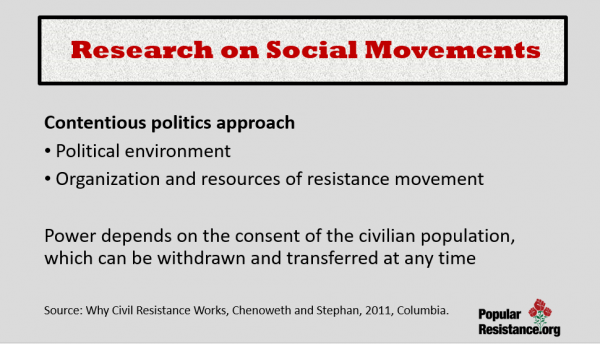 Key workers for movements are those involved involved in transit of people and goods. Religious organizations Can bring a moral or ethical perspective to the movement (or government). They are well connected with funding sources and people. 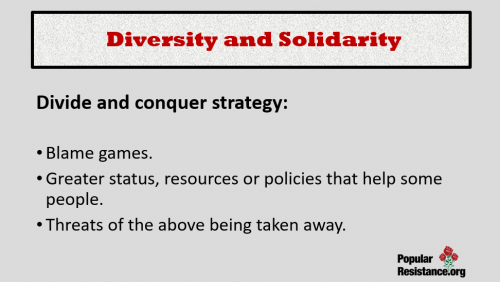 Involving them in the movement can bring other key pillars of power. Non-governmental organizations NGOs can provide services, e.g. in a crisis or storm provide care and necessities. Others include professional organizations, political parties, foreign sources of support (business, government etc. ), small groups in communities from walking/running clubs to knitting circles, to community organizations and garden clubs, book clubs and sports clubs. 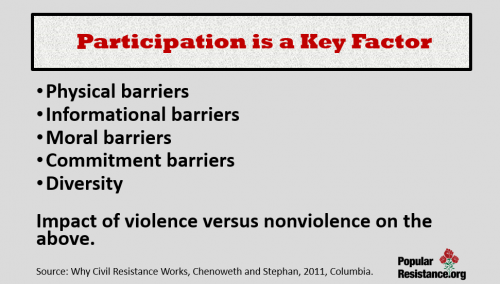 Movements need to develop national consensus and active participation requiring penetrating throughout society. 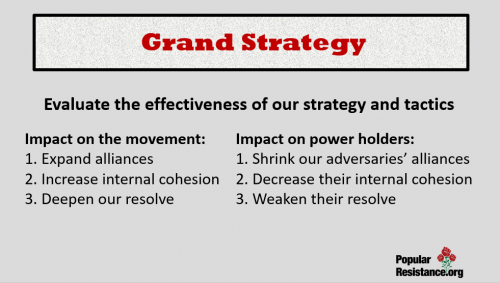 Developing strategies that pull members of the pillars of power to the opposition should be planned early in a campaign. 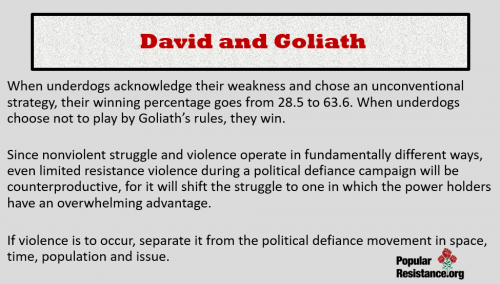 Movements do not want a ‘fight to the finish’ mentality to develop where pillars think they must fight to keep their power. 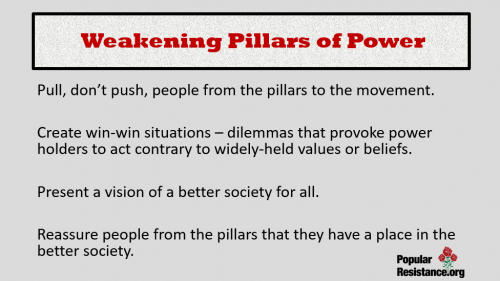 Strategies should be designed with the goal of pulling people from the pillars into the movement. NOTE: In this discussion, dictators are the corporate duopoly and democrats are the people working for a democratic society. 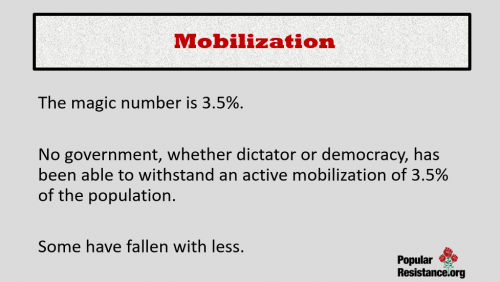 In the case of extreme dictatorships what are the pro-democracy forces to give up to the dictators? What objectives of the dictators are the pro-democracy forces to accept? Are the democrats to give to the dictators (whether a political party or a military cabal) a constitutionally-established permanent role in the future government? Where is the democracy in that? 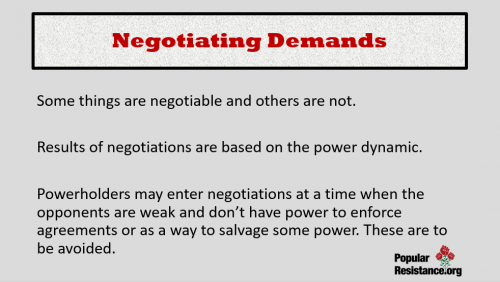 Even assuming that all goes well in negotiations, it is necessary to ask: What kind of peace will be the result? Will life then be better or worse than it would be if the democrats began or continued to struggle? If the democrats agree to halt resistance in order to gain a reprieve from repression, they may be very disappointed. 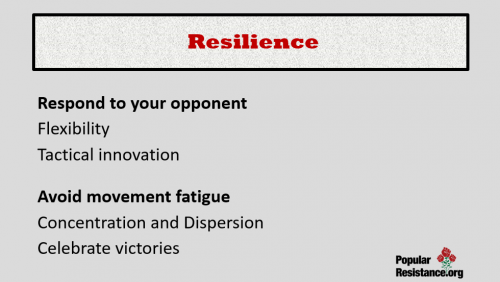 A halt to resistance rarely brings reduced repression. 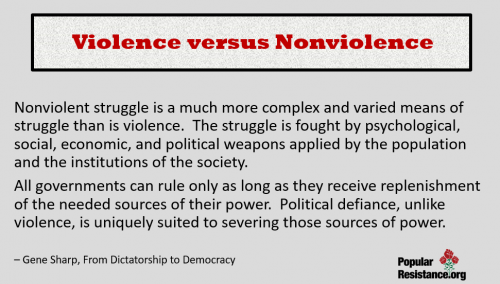 Once the restraining force of internal and international opposition has been removed, dictators may even make their oppression and violence more brutal than before. The collapse of popular resistance often removes the countervailing force that has limited the control and brutality of the dictatorship. The tyrants can then move ahead against whomever they wish. “For the tyrant has the power to inflict only that which we lack the strength to resist,” wrote Krishnalal Shridharani. Sanctions, punishments, threatened or applied, against the disobedient and noncooperative to ensure the submission and cooperation that are needed for the regime to exist and carry out its policies. 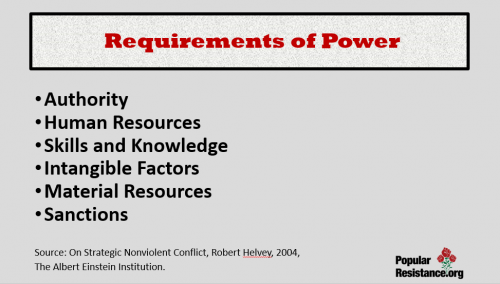 Full cooperation, obedience, and support will increase the availability of the needed sources of power and, consequently, expand the power capacity of any government. On the other hand, withdrawal of popular and institutional cooperation with aggressors and dictators diminishes, and may sever, the availability of the sources of power on which all rulers depend. Without availability of those sources, the rulers’ power weakens and finally dissolves. 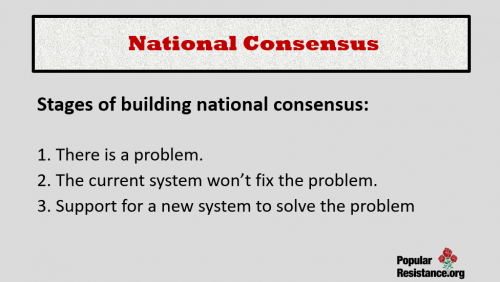 If, despite repression, the sources of power can be restricted or severed for enough time, the initial results may be uncertainty and confusion within the dictatorship. That is likely to be followed by a clear weakening of the power of the dictatorship. 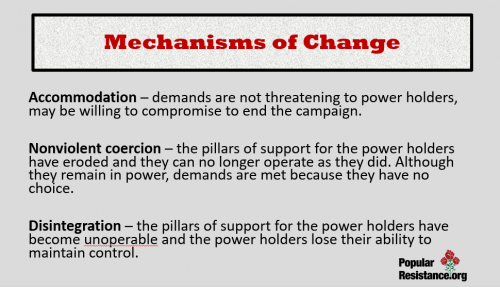 Over time, the withholding of the sources of power can produce the paralysis and impotence of the regime, and in severe cases, its disintegration. The dictators’ power will die, slowly or rapidly, from political starvation. 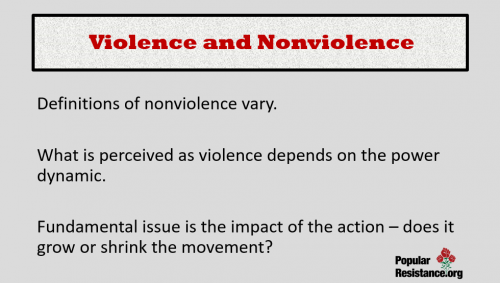 On Strategic Nonviolent Conflict, by Robert Helvey, The Albert Einstein Institution – Read chapters 3 and 4. History Teaches That We have the Power to transform the Nation by Kevin Zeese and Margaret Flowers, 2013. Why Civil Resistance Works: The Strategic Logic of Nonviolent Conflict by Erica Chenoweth and Maria J. Stephan, 2012, Columbia University Press.